I’d hoped to catch the sun as it rose out from the sea, perhaps with the surrounding cliffs being lit by the low light. What actually happened was a little more dramatic and a lot less clichéd as shortly before dawn a thick sea fog swept over the coast wrapping everything in a dense white, then faintly pink, then orange and finally golden yellow blanket of mist which engulfed everything and (hopefully) made for some dramatic shots of the nearby cliffs as well as the sun itself which, peaking through the thick layers of fog, threw a subtle diffuse light across the surface of the sea. After the sunrise it was back to the tent for another two hours sleep before rising again to pack away the tent in a drizzle which coated everything in a fine cold and damp layer of moisture. It was a brief 5 minute drive to Smoo Cave, a huge cave system cut into the cliffs near Durness which has the largest cave opening in the UK and is unique in that part of the cave system was formed by the sea and the other parts formed by the action of freshwater. It is possible to take a guided tour of the caves but my visit was two hours before the tours started which meant that I saw the system in its natutal state without the dramatic artificial lighting but also meant I could only access the easily reached parts. On the plus side it also meant no other visitors so it was deserted! After the caves it was a nice drive along the northern Coast, skirting Loch Eriboll and onto the Kyle of Tongue. A brief stop in Tongue for some breakfast and then off again towards the town of Thurso via the huge Dounreay site. The sun was now high and it was beginning to get hot so a brief stop over in Thurso for petrol and ice creams (I wasn’t expecting to write that when I started this trip!) Gave a welcome break before continuing on the last few miles to John O’Groats, which lying on the north eastern coast is the most northerly inhabited part of the UK. I grabbed the usual touristy snaps of the signs and the shops etc as the sea fog was beginning to role in again and by the time we reached nearby Duncansby Head it was a thick, and thickening dense fog which cut visibility down to around 30 meters at times. I was slightly disappointed with this as I’d hoped to shoot the huge sea stacks which hug the coast here but the mist stopped that. It did however provide some dramatic backdrops for the sheer cliffs which seemed to plunge into nothingness below so I still managed to get some nice shots. The huge colonies of sea birds, including puffins, made the visit worthwhile. After Duncansby it was another one hours drive via Wick to our last stop of the day, Brora, on the eastern coast. The thick fog followed us all the way to the village and the first real bed of the trip. A welcome luxury after several days under canvas. Last day tomorrow; a drive south to Inverness then the long drive back to Glasgow. It’s been a tiring trip but a great one and I’d strongly encourage anyone thinking of doing the trip to go for it, and do it sooner rather than later as it’s becoming very popular and no doubt will soon become overly commercialised. Thanks to everyone who followed me on the trip and thanks to everyone whose hard work has made the route possible. Also special thanks to my travel companion Jonny who’s idea it was to attempt the trip in the first place! After lunch at Shieldaig, the trip north involved a lovely drive along the shores of Loch Torridon and on through Glen Torridon, where I stopped several times to shoot the landscapes which were stunning in the early afternoon light. After the village of Kinlochewe, the route followed the shores of the beautiful Loch Maree but an approaching heavy rain storm curtailed any photography for a while as I rushed to try to outrun the rain. By the time I reached Gruinard Bay the storm was far enough behind us to allow a little break in the sun at the beach. 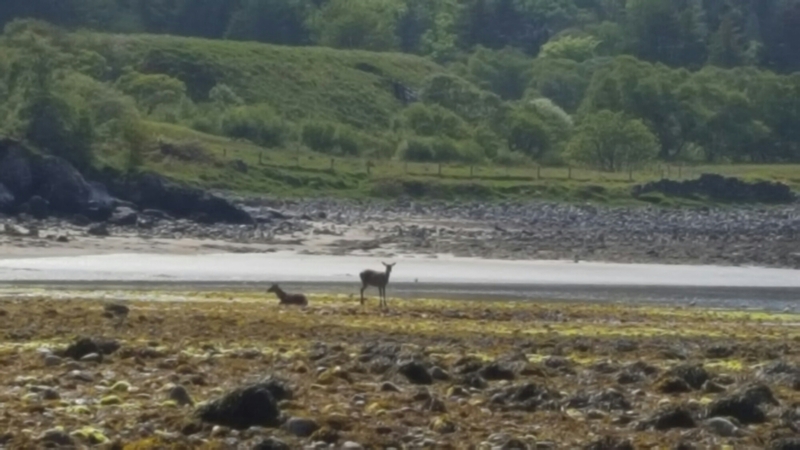 At Gruinard i saw something I’d never seen before, two red deer sunbathing on the beach! It finally hit as we were crossing the high mountain road on the flanks of An Teallach high above Loch Broom. It’s been a while since I’ve experienced rain like that! Thankfully it passed just as quickly as it fell from the heavy sky and by the time we’d reached the Corrieshalloch Gorge it had moved on but I’ve got to say those were some VERY difficult driving conditions! The Corrieshalloch Gorge is terrifyingly stunning! A suspension bridge crosses the Gorge high above the 130ft waterfall (Falls of Measach) which crashes into the Droma River around 300ft below you. The motion of the bridge coupled with the view straight down through the wooden walkway makes the whole experience quite unnerving and this, plus the knowledge that it had already been closed twice in recent years for emergency repairs, meant I couldn’t bring myself to spend too long on that bridge! Others did though, even stopping to video straight down over the edge! 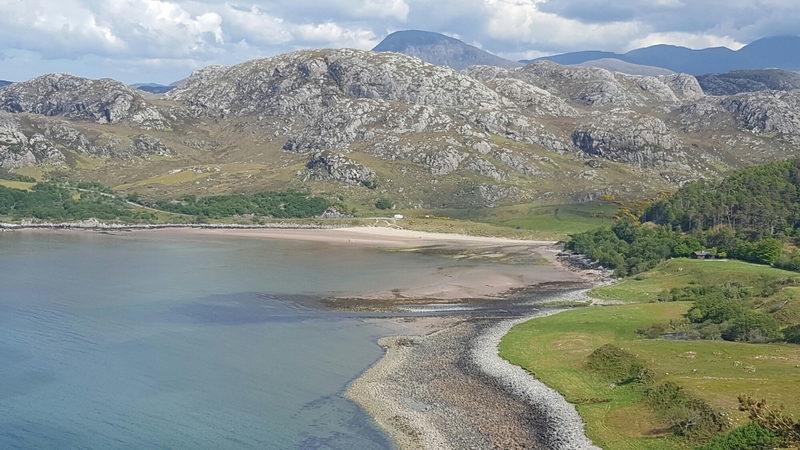 Back in the car, it was a short trip to Ullapool, ferry terminal for the connection between the mainland and the Isle of Lewis in the outer hebrides, then on through Strathcannaird and the high pass which flanks Ben More Assynt and down to the shores of the beautiful Loch Assynt. Loch Assynt is stunning and the late afternoon sunlight combined with dramatic clouds thanks to the rain storm which had now passed over and out to the sea meant quite a while exploring and photographing the ruins of Ardvreck Castle. Back in the car it was time for the long drive to the Kylesku bridge and along the north western coast to Scourie. The long drive, mostly over single track roads which weave in and out hugging the contours of the various hills and skirt the shores of lonely lochs was beginning to take its toll and with another 25 miles across the barren, almost moonlike landscape of this North western tip of mainland Britain ahead, I decided to pack away the camera for the night and head straight to the village of Durness on the north coast. The bleak landscapes of this part of the route, composed of some of the oldest rocks on the surface of the earth (many are more than 4 billion years old) will have to wait just a little longer before I get to photograph them! Definitely an excuse to return as soon as possible though – as is the prospect of a trip out to Cape Wrath and the rugged north western tip of the country. We left Glasgow in a rain shower which followed us all the way north to the outskirts of the Cairngorm national park before it finally stopped and sun begun to break through the heavy clouds. By Inverness the skies has cleared completely and the drive West towards the village of Applecross was stunning! 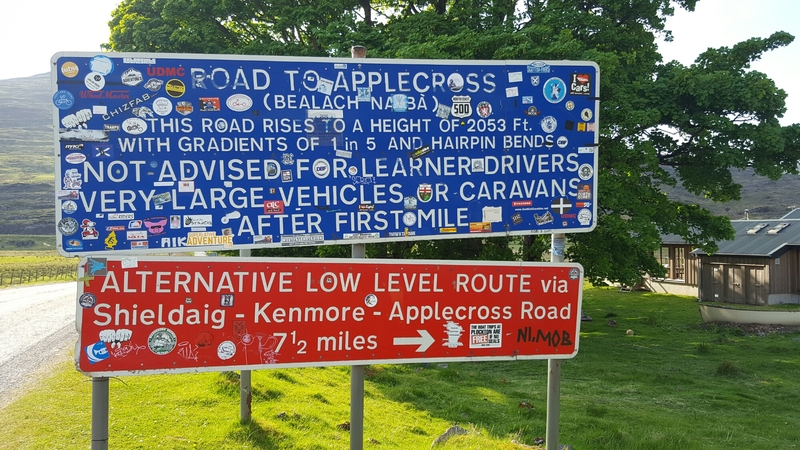 To reach applecross we had to cross the infamous Bealach na ba road. 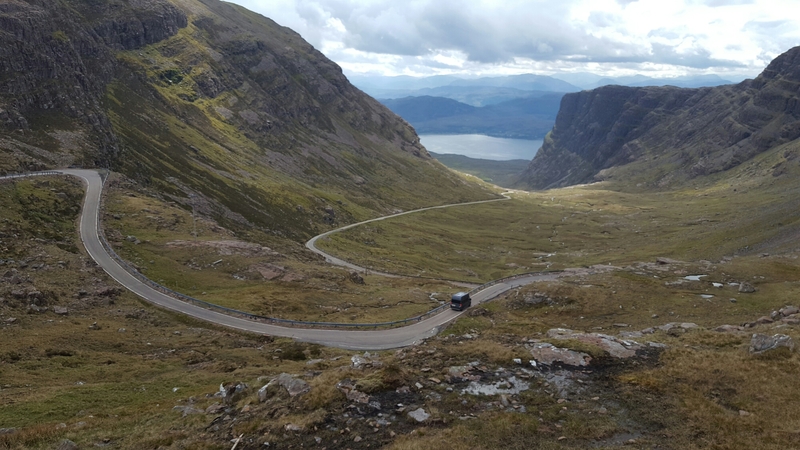 A hairpin bend, 1:5 gradient, single track road that weaves back and forth as it clings to the flank of a huge mountain before gently dropping back to sea level at the village of Applecross. The views at the summit of the pass over the isles of Raasay and Skye are stunning and I manage to get lots of pics to share when I get back. My first night was spent in a lovely little bar in Applecross with a beautiful view over the north of skye. After watching a lovely sunset with a couple of cold beers I set off back to the tent for the night. The weather in the north has been perfect so far, so fingers crossed that it’ll continue for the rest of the trip! 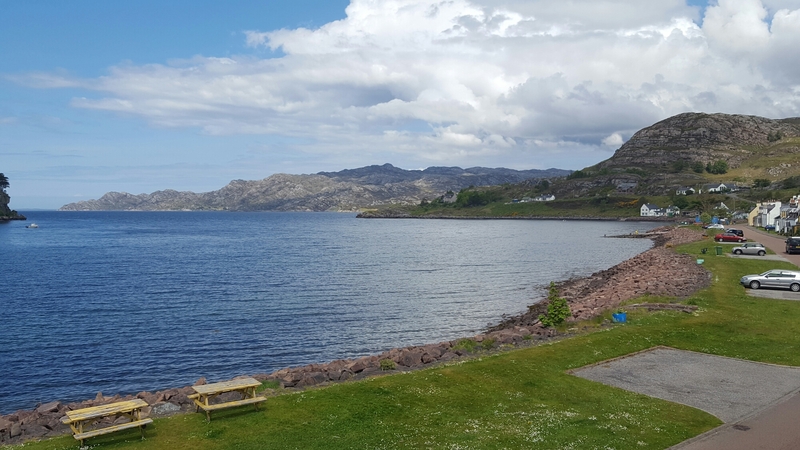 I’m writing this on day 3 in a small balcony overlooking the sea in the village of Shieldaig. It’s another lovely day and I’ve already grabbed a few more shots to share when I get back! Off to Durness now, via torridon, Loch Maree and the coirreshalloch gorge! Just about to set off on the first leg of the North Coast 500. Some really great locations on this route so I’m hoping for good weather and some great shots to share with you all. I’m particularly looking forward to the Bealach na ba pass, Smoo cave, Suilvan, Loch Maree, the Corrieshalloch Gorge and Duncansby sea stacks but I’m sure I’ll find other stunning locations on the way around! 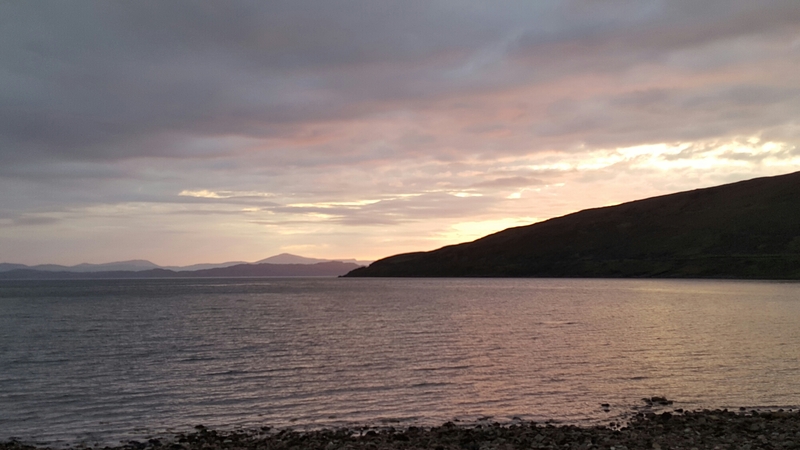 Camping tonight at Applecross so I’m hoping for a nice sunset over the sea. Hopefully I’ll be able to update you all on my progress as I’m doing the route but I’m not sure how the signal will be on the way around. Hope you can enjoy the trip with me!